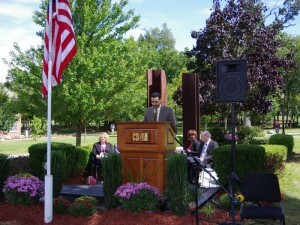 Assistant Vice President for Student Affairs Salvador Mena delivers his remarks at this year's 9/11 Remembrance Ceremony. Students, faculty, and staff at the College of Staten Island gathered at the 9/11 Memorial on campus last week to remember those who lost their lives in the tragic attacks on our country that took place 11 years ago. The event opened with welcoming remarks from CSI Assistant Vice President for Student Affairs, Salvador Mena, as well as from the College’s Interim President Dr. William J. Fritz. The program continued with a guitar performance of “El Canto Lladre” by CSI student Stephen Flannery and a reading of the poem “To the Woman, Not Trying to Fly, Who Fell with Her Legs Closed, Arms Pressed against the Front of Her Body, While Primly Clutching Her Purse” by Assistant Professor of English Patricia Smith. Next, CSI Psychology major and veteran of the United States Marine Corps. Ralph Herrera honored the many volunteers and military personnel who answered the call to provide assistance and response to the attacks. 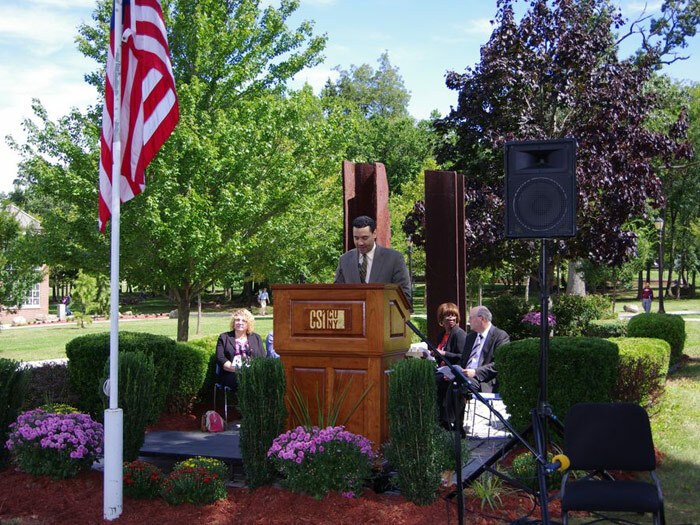 In recognition of the students and alumni who died on 9/11, Francisco Collado ’09, member of the CSI Alumni Board of Directors, read their names, and Amy Posner, Executive Director of Hillel at CSI, provided a closing prayer. To conclude the event, attendees placed flowers near the 9/11 Memorial in memory of the victims. Counselors are available to speak with members of the College community in the Counseling Center in Building 1A, Room 109. The Center is open from 9:00am to 5:00pm, Mondays, Wednesdays, and Fridays, and from 9:00am to 7:30pm on Wednesdays and Thursdays.